Is it currently okay to burn? Residential burning is allowed by permit only, NO burning is allowed from July 1st thru September 30th. Permits are issued at Station 41, 1330 Wells St, or can be obtained online . Burn permits are valid for one (1) year from the date of issue and are not extendable. Upon expiration, the permit holder or designee must be issued a new permit prior to burning. Enumclaw Fire Department appreciates the public’s cooperation with burn bans. 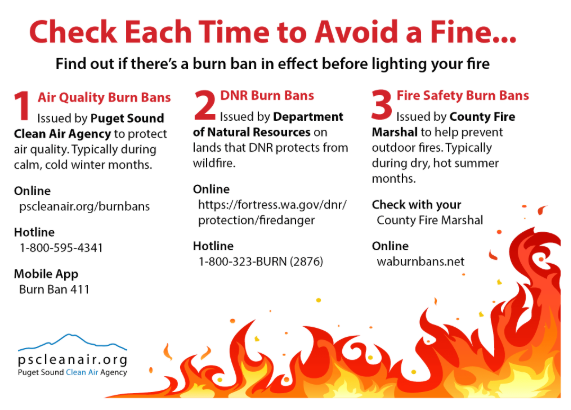 Prior to igniting a fire, citizens are required to check current burn ban status with the King County Fire Marshal Office (Fire-Safety Burn Ban Status) and Puget Sound Clean Air Agency (Air Quality Burn Ban Status). Air quality conditions and air quality forecasts can change quickly in the Puget Sound. Puget Sound Clean Air Agency has created a convenient flyer that outlines the health risks of breathing smoke and what is banned during an air quality burn ban, which can be downloaded by clicking here. Additionally, citizens can sign up on the Puget Sound Clean Air Agency website to receive alerts when an Air Quality Burning Ban is issued or lifted by visiting their Burn Ban Alerts Page. Must be contained in a pit constructed of steel, masonry, or concrete material. The bottom may be of sand, gravel, or mineral earth. Does not require a spark arrestor. Maximum fuel size is 3x3x2. Must be at least 10 feet away from property lines. Must be located 25 feet away from any structure (including decks or any other combustible material). Only allowed to burn dried cord wood, presto logs, or charcoal. Residential outdoor burning in the designated burn areas of Enumclaw Fire Department will remain legal for the foreseeable future. This type of burning is done by residents who have sufficient clear property to burn legally. Residents can burn natural vegetation that comes from their property, such as branches, leaves, clippings, etc. Residential burning is allowed by permit only. Residential burning is only allowed within certain portions of Enumclaw Fire District. Click here to see if your residence is located in an area where residential burning is permitted. Due to city ordinance, residential burning is not allowed within the city limits of Enumclaw. Permits are issued at Station 41, 1330 Wells St, or online. Burn permits are valid for one (1) year from the date of issue and are not extendable. Upon expiration, the permit holder or designee must be issued a new permit prior to burning. Burning is only allowed during daylight hours. A water source is required to be on site at all times. Natural vegetation is the only material allowed to be burned. Only one pile is allowed to be burned at a time. The maximum pile dimensions are 10 feet wide and 4 feet in height. Burn piles are required to be a minimum of 10 feet away from property lines. Burn piles are required to be 50 feet away from any structures. Burn piles must be extinguished whenever there is a storm that results in east winds. A copy of the permit must be kept onsite at all times. Burning processed lumber of any type is prohibited. Burning “green” or wet debris is prohibited. Burning tree limbs larger than 4” (inches) in diameter is prohibited. Burning materials hauled in from another site is prohibited (other than fire wood). CHECK BEFORE YOU BURN: Although many of the days during the designated burning months will be “Burn Days”, impaired air quality or fire danger may necessitate a burn ban. PILE THE DEBRIS: Piling the debris creates a chimney effect during burning and preheats the debris. Hot fires and dry fuel produces less smoke. Remove as much dirt a possible from the debris as you pile it. Dirt in the pile prevents the fire from burning hot and efficiently. BURN DRY DEBRIS: For best results and a cleaner fire, burn when your debris is dry. Cover piles with tree boughs, paper or plastic to keep the debris dry until you are ready to burn. Be sure to remove the paper or plastic prior to burning. GIVE IT AIR: Directing a fan or leaf blower into your fire will help it burn hotter, with less smoke. Plus, you have the added bonus of getting the pile burned in half the time. CHOOSE THE RIGHT WEATHER FOR BURNING: Cloudy days usually have light winds and are the best days to burn. Because air tends to be unstable, there is generally enough air movement on cloudy days to disperse the smoke and avoid causing nuisance smoke. Do not burn when the wind is blowing the smoke towards your neighbor’s homes. Do not burn if there is, or a forecast calls for, thunderstorms, showers, or weather fronts. START THE FIRE AT MIDDAY OR IN EARLY AFTERNOON: Avoid burning when it is foggy. Fog is a sign of stable air that will not disperse the smoke into the atmosphere. If you must burn on clear days start the fire in the afternoon. There is often not enough air movement on clear days to disperse the smoke from your fires. FINISH BURNING BEFORE NIGHTTIME: As temperatures begin to cool later in the day, the air tends to sink. This carries the smoke from your fire down into valleys and low areas. Smoke from your fire may be trapped near the ground during the night and early morning when cool air pools near the ground. This is called an inversion (cool air beneath warm air). Plan to have your burning completed before inversions create a smoke nuisance for your neighbors. Land-clearing burning is prohibited in King County since July, 2008. For additional information regarding land-clearing and alternative disposal methods, you can visit the King County Solid Waste Division page or the Puget Sound Clean Air Agency. If you have a burning complaint which presents hazard to persons or property, please dial 9-1-1 to report the burning. Puget Sound Clean Air Agency is the regulatory authority for smoke and clean air issues. If you wish to report a complaint regarding burning that is causing excess smoke or clean air issues, please contact Puget Sound Clean Air Agency either online via the Air Quality Complaint Center, or via phone at 1-800-552-3565, ext. 6. The phone number is a recorded line with a monitored voicemail box where you can leave a message and receive a call back. For the most prompt response, Puget Sound Clean Air Agency recommends using the online Air Quality Complaint Center.